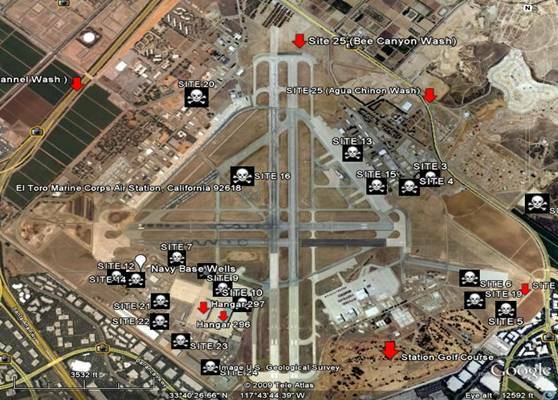 The El Toro Marine Corps Air Station covers approximately 4,700 acres. Commissioned in 1943, it supported the Fleet Marine Forces in the Pacific Ocean, serving as the major west coast jet fighter facility. The Station was decommissioned as an active base in 1999 under the Base Realignment and Closure Act. To date the golf course parcel has been transferred under the Department of the Interior’s Land for Parks program and approximately 2800 acres have been sold through an auction and transferred in part to Heritage Fields LLC. Redevelopment efforts are on-going. A total of 25 potentially contaminated areas were identified on the Air Station, including four landfills suspected of containing both hazardous and solid waste, and other areas where polychlorinated biphenyls (PCBs), battery acids, leaded fuels, and other hazardous substances were suspected of being dumped or spilled. A Remedial Investigation conducted by El Toro identified volatile organic compounds (VOCs), primarily trichloroethene (TCE), in groundwater that migrated more than three miles off base. The primary source of the groundwater contamination was two large aircraft hangars. Land irrigated by wells is located within three miles of the site; however, none of these wells are drinking water sources. Surface water flows into the Upper Newport Bay Ecological Reserve, located approximately eight miles from the base. Two large aircraft hangars were the primary source of the VOC contamination detected in groundwater. This contamination is the principal threat at El Toro. A second VOC plume is present in the central area of the station and is stable. The four landfills have been inactive for more than 25 years. There are some low levels of contamination, primarily VOCs and metals, detected in groundwater adjacent to one landfill. However, this contaminant plume appears to be stable and are not migrating. A perchlorate plume emanating from the old explosive ordnance disposal range is present along a tributary drainage to Borrego Wash. No drinking water sources have been contaminated. The Upper Newport Bay Ecological Reserve is potentially threatened by contaminants from El Toro. This site is being addressed in several long-term remedial phases focusing on cleanup of the groundwater, identification of the sources and cleanup of VOC contamination in soils, and cleanup of abandoned wastewater treatment lines and tanks. The Navy identified 25 sites on the El Toro base with chemical contamination of soil and water that included arsenic, benzene, dioxin, TCE, chloroform, vinyl chloride, and other carcinogens, mutagens, neurotoxins, and developmental toxins (source: US EPA). Many toxic chemicals were used in daily operations by Marines or were created through the use of burn pits and other processes. OU-1 Groundwater Sites 18 & 24: An investigation into the nature and extent of groundwater contamination was completed in 1997. The Navy concluded negotiations with the Orange County Water District and the Irvine Ranch Water District on a joint desalter and VOC treatment project to address El Toro contamination. Final signatures on the Agreement by the Boards, the Navy, and the Department of Justice were obtained in July 2001. A remedy was proposed in November 2001 and a public meeting was held on November 14, 2001. The public comment period ended on December 7, 2001 with no significant comments received. The Record of Decision (ROD) was signed by all Parties on June 27, 2002. The Navy submitted their schedule for remedial design and remedial action in July 2002. The Navy completed the remedial design in 2005 and remedial action construction was completed in mid-2006. The Irvine Ranch Water District portion of the remedy was completed in Spring 2006 and the groundwater extraction and treatment system became fully operational in Fall 2006. A “kick-off” ceremony for the groundwater restoration remedy was held in January 2007. The system is fully operation and groundwater remediation efforts are on-going. OU-3 Site 16: Site 16 (Former Crash Crew Training Pits and Fire Fighting Training Pits) is located within the runways and was an area contaminated with VOCs and petroleum hydrocarbons due to its use as a fire fighting training area where large quantities of solvents were dumped in the pits and then set on fire and subsequently doused with water and chemicals. Soil and groundwater were contaminated with TPHs and VOCs. In 1999-2001, a multi-phase extraction pilot study was conducted which removed significant amounts of VOCs from the soil but had little impact on the groundwater. In September 2002, the Navy released its Proposed Plan and held a public meeting recommending Monitored Natural Attenuation (MNA) for cleanup of the groundwater and continued monitoring of the soil. Petroleum contamination was handled under the State cleanup program. A final ROD was issued July 2003. As part of remedial design, the Navy conducted a predesign action to assist in evaluating whether MNA is operating effectively. The final remedial design documents were approved in January 2006. EPA approved the Operating Properly and Successfully Evaluation for the remedy in Spring 2007. OU-3A Sites 8, 11, & 12: A draft final FS for Sites 8 (former DRMO Storage Yard), 11 (former transformer storage area) and 12 (former sludge drying bed) was submitted for agency review in January 1998. The Sites are contaminated primarily with PCBs in the soil. Groundwater is not impacted by these sites. A ROD for Site 11 requiring soil removal was signed in September 1999 and an Explanation of Significant Differences was signed in May 2003. The Navy completed excavation and disposal of contaminated soil at Site 11 in Summer 2005. Closeout of this site was approved by EPA in February 2006. A FS Addendum was completed for Site 8 in February 2006. The ROD for Sites 8 and 12 was reissued in May 2006 and signed by the Navy and EPA in Spring 2007. The remedial design was completed in December 2008. Remedial actions at these sites commenced in Winter 2009. USTs and Abandoned Wastewater Treatment Lines and Tanks: El Toro Marine Corps Air Station began a study into the nature and extent of contamination caused by abandoned wastewater treatment lines and leaking tanks. The investigation was completed in mid-1996. Numerous former underground storage tanks (USTs) have been declared for no further action. The Navy has constructed free product removal systems and SVE systems as deemed appropriate by the State. Closure work is on-going at a number of USTs. OU-2 Site 2 Groundwater: Investigations at Site 2 (landfill) indicated two small-scale VOC plumes associated with disposal areas outside of the landfill footprint. A FS Addendum was submitted in 2005 and completion of the FS was held up for the completion of further investigations of this groundwater contamination in 2006. Site 2 groundwater has been coupled with Site 1 groundwater since the perchlorate plume originating at Site 1 is present at Site 2. Pilot studies field work on potential in-situ remedial technologies for groundwater are in progress. A FS that addressed groundwater contamination at Sites 1 and 2 was finalized in 2011. The Record of Decision (ROD) was signed in February 2012. OU-2C Anomaly Area 3: The Navy submitted a combined RI/ FS for this site in December 2005. AA-3 was used as a source of borrow material; records indicated that some of the borrow pits and trenches were backfilled with construction debris and other waste and covered with 5 feet or more of fill material. The RI/FS was finalized in 2009. OU-3 Site 1: The Navy completed a RI at Site 1 (Former Explosive Ordnance Disposal [EOD] Range) in 2005. The EOD Range was in operation from 1952 until 1999 when the base ceased operations. Military Ordnance used at the EOD Range included hand grenades, land mines, cluster bombs, and rocket warheads as well as commercial explosives. The final RI Report was released in December 2006. The major concern to date includes a groundwater plume of perchlorate discovered beneath the range and migrating downgradient onto Site 2. A draft FS was submitted in January 2007. The FS for soils and munitions and explosives of concern will be finalized and a decision on remedial actions for these media was completed 2012. Pilot studies field work on potential in-situ remedial technologies for groundwater are in progress. A FS that addresses groundwater contamination at Sites 1 and 2 will be finalized following the pilot studies. The Record of Decision (ROD) addressing remedial actions for groundwater at Sites 1 and 2 was signed in February 2012. OU-2B & OU-2C Landfills: A Proposed Plan to cap the four landfills – Sites 2 &17 and Sites 3 &5 — went out for public comment in March 1998. In addition to capping, two of the landfills — Sites 2 & 17 — will undergo habitat restoration for the endangered California Gnatcatcher. An interim ROD for Landfill Sites 2 & 17 was signed in April 2000. The design was completed for Sites 2 and 17 in Fall 2005 and the Navy began construction of the caps at that time. Capping and habitat restoration is complete at Site 2 and work is nearing completion at Site 17. The pre-design investigation workplan for Sites 3 and 5 was finalized in August 2002 and fieldwork began in Fall 2002. The final Feasibility Study (FS) Addendum was submitted in late 2006, a Proposed Plan was issued early in 2007, and the ROD was signed in early 2008. The design efforts for capping the landfills with remedial actions were completed in 2009. OU-1 Site 24 Soil: An interim ROD for Site 24 soil was signed in September 1997 to address soil contaminated with VOCs in the vicinity of the two aircraft hangars. The soil contamination has impacted the groundwater beneath the base. The selected remedy was Soil Vapor Extraction (SVE). The SVE system used at Norton Air Force Base was taken to MCAS El Toro, retrofitted, and operated from May 1999 to September 2000. Rebound testing at that time confirmed that soil gas cleanup goals had been attained. The regulators approved the Navy’s closure plan for the site. However, soil gas and groundwater monitoring wells will remain in place until operation of the groundwater cleanup system has been confirmed to be addressing the remaining contamination. A No Further Action ROD for Site 24 soil was signed by all Parties in March 2006. OU-3B Sites 7 & 14: A draft Remedial Investigation (RI) Report for Sites 7 (former drop tank storage and drainage area) and 14 (former battery acid disposal area) were submitted to the regulatory agencies in September 1999. A ROD documenting No Further Action for Sites 7 and 14 was signed by the Navy and EPA in Spring 2001. El Toro Marine Corps Air Station is participating in the Installation Restoration Program, a specially funded program established by the Department of Defense (DOD) in 1978 to identify, investigate, and control the migration of hazardous contaminants at military and other DOD facilities. 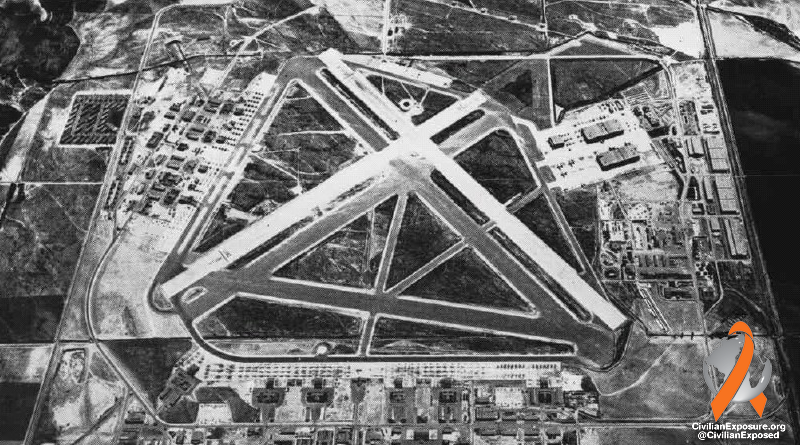 El Toro Marine Corps Air Station was approved for closure under the 1993 Defense Base Closure and Realignment Commission and Congressional Action, which established special accounts for funding the environmental cleanup at closing bases. Further funding for cleanup was procured through the sale of much of the former base in 2005. *Note – We’ve posted, verbatim, the information from the EPA on El Toro on this page rather than simply sharing a link. This is to maintain an ongoing record of the information to-date as of October 2015, in the event it is edited or removed from their site in the future. You can view the link to the EPA page here: EPA Superfund Site – MCAS El Toro.